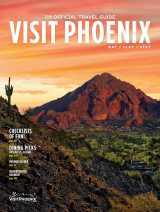 Phoenix’s dining scene, particularly along the city’s main thoroughfare of Central Avenue, is brimming with restaurants, some of which have recently opened and others that are well-trenched in dining success. 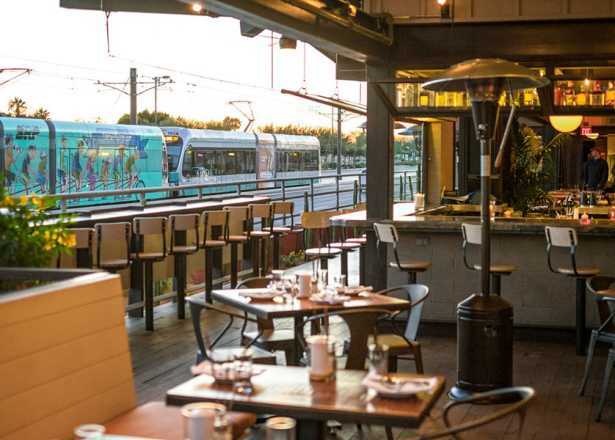 The Valley Metro light rail might have laid the tracks for the uptick in restaurant launches along the Central Corridor route in the last few years. 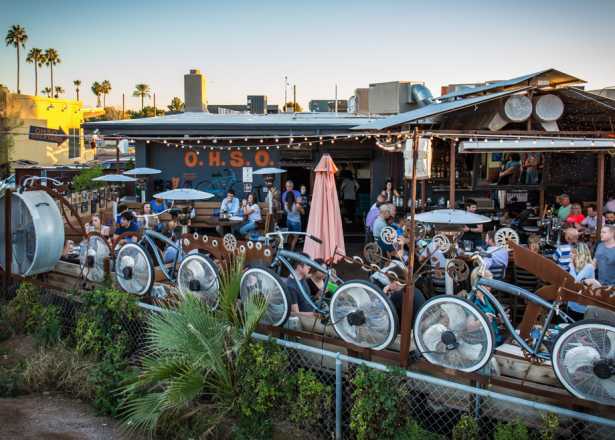 But whatever the reason, central Phoenix has evolved into a dining destination that caters to just about every palate, from burgers and fusion, to culturally distinct fare and elevated desert cuisine. 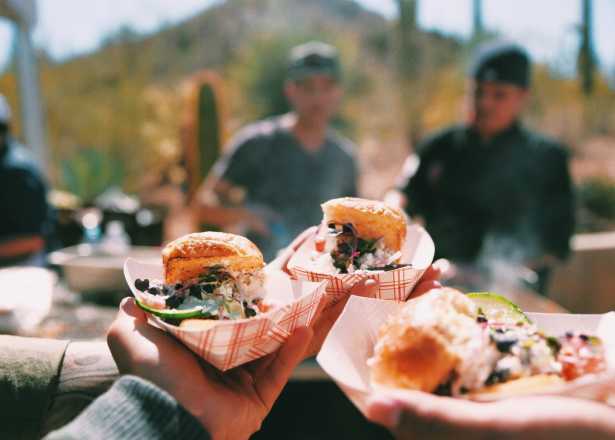 If you’re not quite sure where to eat, follow the food trail along Central Avenue, a guide post from midtown to uptown, to experience the many restaurants in central Phoenix. A good place to start is FEZ, a Mediterranean-inspired restaurant located off Central, just around the corner on Portland Street and First Avenue. Diners flock to this midtown favorite for its arty demeanor, savory soups, sandwiches and burgers, $5 daily drink specials and the shaded, dog-friendly patio. Or head a little further north on Central between McDowell and Thomas roads into New American food territory at Switch Restaurant & Wine Bar, a chill spot known for its signature cocktails and small and large plates. If you’re feeling really adventurous, keep trekking forward to The Wild Thaiger, a family-owned Thai restaurant just south of Thomas Road that serves up contemporary cultural spice with classic curry dishes, sticky rice, pad Thai, beef, and seafood lunch and dinner options. To savor a multitude of global flavors in one food service, cross Indian School Road and visit Clever Koi, a Pan-Asian bistro that daringly goes into refined, uncharted waters with a menu that represents Vietnam, China, Japan and Korea in its flavor profile and offers a generous craft cocktail and wine list. In the same stretch of street you’ll find Pane Bianco, which started out as a low-key, but high-quality counter service for lunch-time artisan sandwiches served on crusty, focaccia wood-fired bread. In addition to lunch, Pane now offers full-service dinner serving Chris Bianco’s famed pizzas, including the Rosa. For an island feel, continue north on Central to Hula’s Modern Tiki, which pays tribute to vintage tikis with hipster, open-air décor and breezy Polynesian-focused appetizers, entrees and signature tropical drinks. Grass skirt optional. 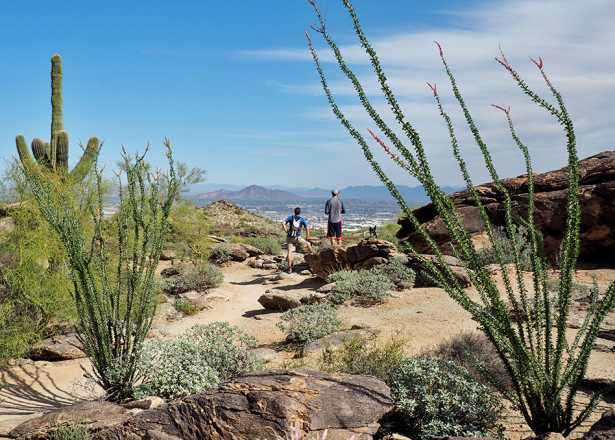 The next stop is Uptown Plaza located at the intersection of Camelback Road and Central, home to a batch of new restaurants elevating Phoenix’s dining scene. 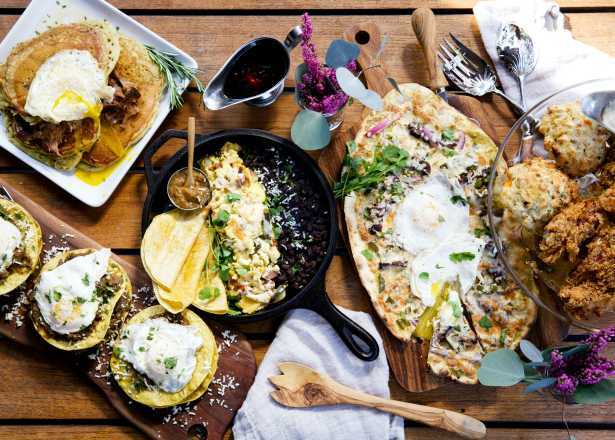 Offerings include Zookz, where the emphasis is on toasted, gooey breakfast and lunch sandwiches made from specially-prepared bread with artful fillings for a perfect meal. You also can get enlightened at Flower Child, which sends good vibes with its healthy, peaceful fare made with lots of organic, natural, grass-fed and gluten-free vegetables, grains, salads and meats choices. For pure Americana, stop at the Shake Shack, a gourmet chain approach to fast-food with burgers, hot dogs, shakes, frozen custard, and beer and wine. Or, if you’re hankering for an iconic Chicago-style deep-dish pie made with fresh mozzarella from Wisconsin and a buttery crust created by a reverse osmosis process, check out the first Phoenix location of Lou Malnati’s Pizzeria. Across from Lou’s is the Huss Taproom, the flagship tasting spot for the local, family-owned brewery that welcomes you to try its range of popular craft beers, and small bites and noshes. Just a stone’s throw north of Uptown Plaza’s crossroads lays a cluster of restaurants owned by Upward Projects, completing the Central Avenue dining circle. While the restaurant group tends to repurpose vintage and quirky buildings into fashionable trendy eateries, you can be certain the menu lineup at each of their restaurants has distinct style and flavors. Postino Wine Café, the first restaurant to populate Upward Projects neighborhood collective along Central, is famous for its extensive, but affordable global wine list and dinner-worthy bites like paninis, salads and boards of bruschetta. Just past Postino is the group’s clever twist on a Southwest staple, Joyride Taco House, which is open for lunch and dinner and features funky, mid-century modern ambience. Upward Projects’s taste for salvaging is also evident at Federal Pizza, which is housed in the refurbished former First Federal Bank building designed by Al Beadle and where you can dine-in or drive-thru to pick up a wood-fired pie, appetizers, and freshly-made salads and sandwiches. For a true sense of nostalgia, head directly across the street from Federal Pizza to Windsor, the restaurant group’s cozy, but well-appointed gastropub named after the historic residential neighborhood with elevated bar eats, brunch, craft beer and wine, Prohibition-style cocktails and a backyard-style patio. Next door, fittingly, is Churn, the group’s old-timey ice cream shop that scoops up freshly churned ice cream, gifts and toys—and the perfect place to wrap up a downtown meal and satisfy your sweet craving. 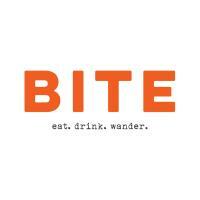 However you map your dining itinerary for Central Phoenix, it is well worth the food trip. Bon appetit! 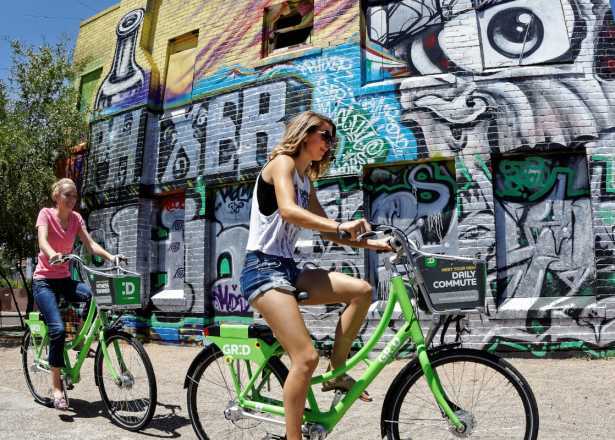 Rent a Grid Bike and pedal off on a two-wheel tour of Central Phoenix&apos;s arts and culture scene.